1320 27th St. Ste. B. We love what we do here, but that’s not even the half of it. Scroll down (or filter) for a peek into our weird, wonderful ways. Berto is a professional pensive who seeks out the efficiencies in everything. A social architect, he's always expanding his network of "friends who can do that" by way of his natural smell-good musk and his reputation as giver of the best hugs. Berto left the Midwest to live his best life, but relives the worst day whenever he forgets his chapstick at home. Berto's endorphin triggers include cotton candy skies, musical swells in film, and PBJ's. Jessica got into the words game early by selling short stories to her fourth-grade classmates at a quarter a pop. She picked things up again much later when she tripped over a creative writing degree and fell into a career in advertising. She loves tiny things, bodega flowers, and anyone who understands why she finds the show Trailer Park Boys both genius and soothing. A southerner with no accent to speak of, Jessica probably wants to get coffee with you to talk about your thoughts. Katherine’s journey to Madwell Developer involved layovers in Engineering (her first internship was at a crane company), Journalism (she’s worked for a few newspapers in her day), and PR (which drove her to teach herself coding, volunteer for small projects, and then jump departments). She can weld and operate a forklift, both of which will definitely come in handy in the very near future. Katherine was the first person in her family to be born outside Texas since before the Civil War. Conor joined Madwell in our equivalent of the stone age, when we still worked in a one-room loft and designed things by rubbing sticks together. Over the years, his interests have grown far beyond his foundations in fine art and digital design into printmaking, animation, even some code—anything he can get his sticks on. In fact, he gets so worked up about all the cool things he has yet to create that sometimes he just watches Netflix instead. Conor has the daddest dad humor of us all. Jessie spent 29 trips around the sun in Boston before running for the hills (mountains) with two suitcases (of athleisure) and a planner. After a quarter life crisis dressed as the LSATs, Jessie dove head first into agency life and never looked back. With roles in PR and paid advertising in her background, the AM/PM hybrid thing is win-win for this Libra. 25% Andie Anderson, 25% Rachel Green and 50% Helga G. Pataki. She proudly serves House Tyrell. And now, representing the great state of Alabama...it’s Lindsey! Lindsey comes packing a mad love of numbers, the ability to connect every dot, and a knack for the arts (she’s not ALL right brain, people). Come weekends, you’ll catch her jumping with her off-the-track thoroughbred, the distinguished Miss Queen Louise. Lindsey is the daughter of a State Trooper, and thus has lived in every corner of her home state. Diana started her career as a copywriter in an agency so tiny that she doubled as hand model for a ballpoint pen account. So tiny that on shoot day, the client paid to have only one hand manicured. These days, she’s saved enough to have all fingers and toes tended to. Good thing, since you’ll find her in flip flops till the first snow. Diana’s into fermenting things, so keep your cabbages under lock and key. A maker of stuff from day one, Jeremiah spent his formative years the way any curious kid would: taking apart and rebuilding all of his toys. After a first career as a stagehand (ever heard of Slayer?) Jeremiah discovered his passion for fabrication. If he’s not off in a corner playing with tools, you’ll probably find him exploring his two other passions: snacking and napping. Jeremiah once fabricated a dead body for Law & Order. Josh was drawn to advertising in college because it aligned all of his favorite things: words, pictures, grandiose concepts, and novelty swag. He moved to NYC post graduation and landed straight into Bushwick, a wonderland he’s since been exploring one bodega sandwich at a time. Having been busted in an illicit potato smuggling operation, Josh is no longer legally allowed in the state of Idaho. Kirby loves taking things apart and putting them back together again; he also loves hunting for creative ways to solve creative problems. So it’s no surprise that, driven by curiosity about how design and code interact, he simply went ahead and taught himself to code. More surprising, maybe, is his undying love of tiki drinks. Important fact twofer: Kirby plays in a doom metal band and has a dachshund named Petunia. Mike is a tough man to pin down. An expert-level frequent flyer, he once flew from New York City to Honolulu and back again just for the frequent flyer miles (and a quick Mai Tai). There’s a good chance the giant red "escape" key on his keyboard teleports him to the nearest airport. How do you say “consumer insights” in French? Madwell’s resident francophone has a keen interest in the construction of identity, an inclination towards strategic games, and a Swiss passport, all of which makes him the perfect guy for strategic brand conceptualizing and/or all your after-work French tutoring needs. Between long road trips and tour managing bands, Alexandre has traveled across basically all of the 50 states. Stephen was working as a graphic designer in sunny California when he stumbled across copywriting, fell head over heels, and landed smack dab in New York City. When he’s not mustering up copy for Madwell, you can find him battling it out on the Bryant Park ping pong tables or in his kitchen trying to replicate his grandma’s phở recipe. The mouse in this pic did all of its own stunts and was not harmed in any way. Chris believes great work ethic is the backbone of design. He spent the past eight years rowing competitively at the Varsity and Collegiate level, a sport requiring daily 5 am wake-ups. Luckily, this has given him a high tolerance to the effects of sleep deprivation, an accepted job hazard for any young designer. He also has a mild obsession with Chipotle and struggles each day he goes without it. Chipotle, you're on notice: come to Bushwick, dammit. Has a passionate hatred for shoe laces and is anxiously waiting for the day velcro comes back into style. Hailing from a family steeped in the visual arts (her great-grandfather was a typesetter in the Depression and her mother is an artist/art teacher), Julia is one of Madwell’s resident experts in making things look awesome. Her heroes are Carl Sagan, David Attenborough, and Edward Gorey. Julia is also quite fond of kittens, steak, and becomes irritable with lack of proper food and rest. Reared in Belgium. But can’t speak French. Or Flemish. So what if Joe is horribly uncoordinated and generally not great with his hands? Computers don’t mind, and there’s nothing a good backspace and refresh can’t fix. Since first tinkering with code at age 11, Joe has made all kinds of neat stuff sans hand-eye coordination. Let’s just keep him away from the laser cutter, please. Joe once landed a job tutoring the Mayor of Istanbul's son based on his entirely average knowledge of John Cena. As a middle school recluse, Wake spent just enough time drawing and staring at a computer to realize that design was for him. But while careers are lucrative and all, so is spending your first year out of college in the world's second-northernmost capital just to discover you can eat a whole peach in one bite. Time is money, people. Time is money. Eric put in time on sets all over LA before trading “Hollywood glamour” for indie film distribution and the chance to start managing creative teams. Against all odds (aka, a crippling taco infatuation), he later moved to NYC; here he gets to blend his creative spirit with his love of reformatting itemized budget spreadsheets. Eric shares a birthday with EGOT icon Whoopi Goldberg. Truly, there is no higher honor. After deciding—by majoring in it—that political science wasn't his speed, Joe followed the advice of a wise sensei guidance counselor and gave marketing a go. Ever since his first job as a wee AAE, he’s been realizing his passion for connecting marketing and business objectives with the cultural moment. His other passion: BBQ ribs. Way back when, Joe wrote and creative directed not one, but two Twix commercials. Libby fell in love with words early on, writing her first “novel” at the age of nine on her parents’ computer. (The book was Titanic fanfiction, as one does in 1998.) Originally from the Midwest, she studied journalism and psychology in college and then moved to the Big Apple. Turns out her background vibed with advertising, and her disposition vibed with New York City. Libby hasn’t eaten a doughnut in 20 years. Could Bushwick’s Dun-Well Doughnuts break the streak? Only time will tell. The key to Rachel’s success isn’t the ability to channel her inner Elle Woods or Sporty Spice on command; it’s knowing never to channel them at the same time. Other winning factors include her Philly native status, her friendship with every member of the Washington Wizards who played between 2011-15 and a supportive relationship with her cat, Penn. Hi, Penn. Rachel has been slimed on Slime Time Live. After the physical and emotional stress of bear fighting got to be too much, Andy “retired” to the design world. Now he spends his days staring at the computer screen, pushing pixels around, and winning the Sonos game in the Colorado office. Andy once ate so much food at an all-you-can-eat-buffet that they kicked him out and accused him of hiding food in his pockets. To this day, he swears he’s not a buffet cheater. Laura’s greatest hits as a writer include burning holes through the keys on her keyboard and maintaining all these goddern bios. She divides her free time between eating her weight in noodles and introducing herself to other people’s pets. Bangs are the windows to the soul. Thanks, whoever invited Maria out that one night. Your awesomely debaucherous plans led to a less-than-awesome hangover, which led Maria to drink a restorative Vita Coco, which led her to us. Without you, we wouldn’t have this Led Zeppelin-loving, Brazilian Jiu-Jitsu-slinging creative star in our sky. Keep it up! Maria absolutely loves tomatoes, so Operation Tomatina is definitely on her horizon. What do Bar Mitzvah backup dancing and accounting have in common? Passion, curiosity, attention to detail…and Doug. Discerning by nature, Doug is naturally also among the fussiest of the fussy Madwellian eaters, our beloved King of Carbs. Bring him your pastas, your breads, your cookies, your crackers, your cakes. Now you're speaking Doug’s language. Fun Fact: Despite his last name, Doug dislikes any and all seafood. Emma’s first design project was an interactive map of her high school, an archaeological wonder that’s still in use today. After a brief career crisis (you can’t survive off screen printing? How about cat ladying? ), she’s happily employed as a Madwell designer, patiently awaiting the day she’ll retire on a goat farm to eat cheese, snuggle cats, and screen print all day. All the good ideas happen right before you fall asleep, which only helps you if you sleep. No matter the temperature, Kristina will absolutely only drink her coffee iced. No ifs, ands, or buts. Matt sees effectiveness in design as providing a holistic experience that breeds trust, delight, and true engagement with users. His sensibilities are influenced by his background in architecture; he often dives into distinct project components including visual/interactive design, coding, or conceptual planning. He and David constantly battle for the title of Madwell Ping Pong Champion, but only after Matt has made a ritual French Press. When his career as a professional soccer player “didn’t take off,” David pivoted to a career in video game design. Bad news, though: design school is less about video game design and more about design-design. Good thing seeing your ideas come to life is pretty darn awesome, even when it has nothing whatsoever to do with FIFA 19. David survived a whole year wearing only 8 pairs of underwear, 8 shirts, 2 pairs of pants, and 2 pairs of shorts. Rachael was her own first client. Her career in marketing began back in college, when she valiantly petitioned her university board to create her a DIY major. Today, kindly measure her success in the decade’s-worth of Metro North ticket stubs she’s collected while commuting to the Big Apple to put those marketing smarts to work. Rachael’s idea of a perfect day is a day without a cell phone. Jeff is an inventor who moonlights as a writer who daylights as a creative director. What Jeff does best, though, is churn out creative ideas however a brand needs them most, and he’s got the trophy case to prove it. But his favorite job of all? That’s easy: Dad. Jeff has had a lot of jobs in his time, including (but not limited to) a gig as a parachute packer. Joanna’s preferred sport? A brisk walk. Some might say Rebecca eats, sleeps, and breathes Madwell. That's because she lives 15 literal seconds from the office. A California transplant with a perma-cold from October to March, she ended up living and working on Boerum Street after a stint copywriting at a communications agency for nonprofits. When she's not putting pen to paper (okay, fingers to keyboard) at Madwell, she's searching Petfinder for a hound she will name Hunk. He’ll wear a bandana. A New York native, Julia headed west to Colorado for college and ended up sticking around twice as long as expected. There she worked with one agency specializing in custom installs, apparel, and high-end merch and another, smaller shop (population: Julia) working alongside a polar explorer. Team arctic wildlife for life, y’all. Julia has had nightmares involving Oreos. You might recognize Dana from that one beauty pageant she won. In Texas. As a baby. Or maybe you were a student of hers when she was a professor of fine arts, or you know her work as an interspecies installation artist. We know her as a mega-dimensional creative producer who can sense the presence of popcorn anywhere within a one-mile radius. An online quiz told Dana she’s a lion. She hasn’t met many lions, so it’s hard to know for sure. In a parallel universe, Will is an engineer. In this universe, Will left engineering school to become a chef, a career he actually likes. Building on his experience baking and selling apple pies to his neighbors at age 6, Will blends business and chef-ery to help Madwell develop and launch new food innovations (and host the occasional high-end backyard barbecue). Will’s favorite food is whatever vegetables are in season. Sean takes organization and cleanliness very seriously, except when it comes to cleaning his own keyboard. He’s a double index finger typing prodigy who loves discussing social marketing trends as much as he likes pontificating about whiskey. FYI, you’re drinking it wrong. He’s not a millennial. Shhh, he doesn’t know it. Our resident Southern spokesman knows a thing or two about hospitality. Be it a tall glass of water in the morning or a hot toddy at night, you’ll always be taken care of when Clarence is in charge. Unless he’s on a photoshoot with his trusty Canon DSLR, that is, in which case: y’all come back later now, you hear? Clarence is slowly—keyword, slowly—working himself towards veganism. A Brooklyn native, Jackson got his foot in the door at Madwell purely by chance. After being wrapped in a towel and half-heartedly put up for adoption, Jackson proved himself to be an essential part of the team, and he’s been here ever since. His interests include cosplay, cheese, and killing. In spite of being on staff for years, Jackson has yet to work a single billable hour. Tweenage Alex emerged from her first-of-its-kind creative high school with nothing but pure love for design (and a documentary about mimes). Now, fueled by her Bay Area chill/Detroit hustle/NYC ambition, grown-up Alex wakes up ready to rock steady every day, so pumped to work her craft that it moves her to tears on the hour. For three years, Alex spent her Saturday mornings teaching art and creative writing in a maximum-security prison. After riding the glory wave as a pre-teen hot dog eating sensation and burning out of conservatory as a trumpeter, Nate made the natural transition into political speechwriting, and then advertising. These days, you can find him hating on the Yankees, searching for ways to combine pizza and poké, and convincing doubters he really does have three middle names. Given the opportunity, Nate will never say no to watching Con Air. Devin is on a lifelong quest to find the world's best chicken wings. Take it in: this right here is Madwell’s wildest road racer. Catch Clay tearing up the bike lanes in his signature neon vest as he pedals thousands of miles within Brooklyn alone. Clay’s lesser-known abilities include extraordinarily good cooking, extraordinary screen prints, and, perhaps most extraordinarily, blanket making. Clay got to hang out with the Muppets for four whole years while working on a Jim Henson exhibition. Ben is a man of few words, but all of them are in Australian (he moved to NYC from Down Under six-ish years ago). Luckily we’ve been able to communicate using a series of elaborate hand signals, so we’ve learned that he subscribes to a few fundamental truths: seafood is the best food, mountain goats are a noble beast, and design is a good thing because it’s a learning process that doesn’t seem to have an end. Given the option, Ben’s superpower would involve flying (so as to reduce the cost of visiting Australia, duh). Skateboard, surfboard, snowboard: if you can ride it, Matt’s all about it. No board, no problem; this outdoorsman dabbles in foot travel too. He once hiked 850 whole miles through the Pacific Northwest! In two months! With no backpacking experience! What can’t he do? Conjure coffee out of thin air, that’s what. When not working or adventuring, Matt moonlights as an amateur tattoo artist. Avi knows what he wants. He wants spinach, not kale. He wants mornings, not evenings. He wants hugs, not handshakes. Most importantly, Avi wants to aestheticize our world—and that’s exactly what he’s been doing since he started a clothing line in high school. The overheads never allowed for much profit, the venture was well worth it. Sorry, Avi can’t come to your party tonight, he has a pickup soccer game he simply must attend. 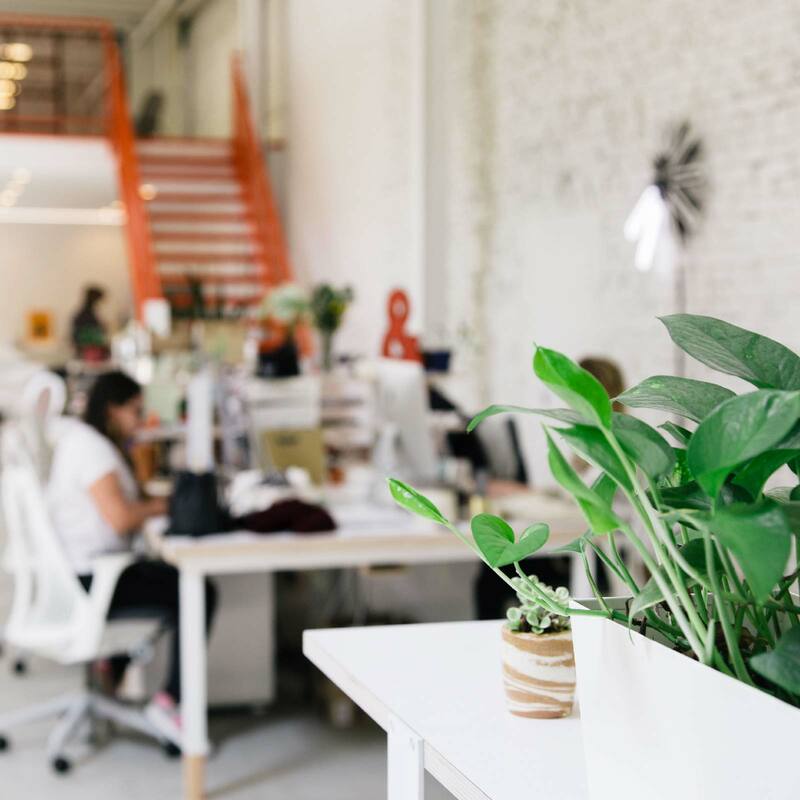 Sarah has had marketing on the mind ever since she was a wee college undergrad, but after discovering the perfect storm of business and creative that is agency life, she was officially hooked. In between campaigns, this globetrotter has managed to visit a whopping 30 countries, including Germany (and not even just because it was Oktoberfest). Prost! Looking for the perfect song for the perfect mood? Sarah’s got you covered. There are only a few things on this earth he does not have an opinion about. A Virgo, Hilary was astrologically destined to find peace in spreadsheets. A superbly organized creative wrangler, she’s also a Cicerone (it’s like a sommelier...but for BEER). Speaking of fancy words, Hilary speaks French. So you can feel free to ask her for une fromage recommandation, s'il vous plaît. Hilary would like to take this opportunity to give a shout out to her pops: "LOOK, I’M ON A WEBSITE!" Even as a wee college student, Patty knew she wanted a career in marketing. Armed with a degree in advertising and her Minnesota niceness, she moved to Denver to find her place in this crazy industry. She soon found her passion for social media management because of its ever-changing nature and its exposure to all the friendliest people on the internet. Patty once had a Twitter conversation with Ricky Martin. As a creative and commercial director, Adam has worked with a towering who’s who of bands and brands (cue the name drop: Nike, Ford, Google, MTV, Heineken, Beck, The National, Regina Spektor...). Maybe you even saw his movie posters for Boogie Nights and Happiness. Yep, that was Adam, living the dream, never letting that Brazil nut allergy hold him back. Adam has three kids and a ten-pound dog named Moose. This trilingual developer will out-code you in three languages before you can even say HTML. He’s been in the tech game since he was 20, and from teaching computer science to building new sites, his lightning speed and love of learning keep him super duper duper sharp. Danny is ambidextrous but still prefers to divide and conquer (right hand for writing and eating, left hand for everything else). Can you name all the ingredients in a polyjuice potion? Our (un)official Harry Potter scholar can. In the Hogwarts dining hall, you’ll find her at the Gryffindor table; in New York City, you’ll find her in Flushing, at one of her “top secret” Sichuan spots. Don’t sleep on asking her for her recs, either. They’re drool-worthy. No one loves The Sims like Lindsey loves The Sims. Anna was once bit on the buttocks by a penguin. And she has an unhealthy (literally) fear of vegetables. Jenny once spent a whole summer running a chicken stand at a New York flea market. Charity had had just about enough of changing bed pans in the ER when she decided to do something a bit more…colorful, if you will. So she tossed out her latex gloves and dove head first into the bright and brilliant world of word wizardry. When not scribbling or typing away, you can find her in the dance studio, tickling the ivories, and wearing clothes that aren’t scrubs. Despite checking every gift shop on every trip she’s ever taken, she's still not found her name on a tiny souvenir license plate. Mike hails from a long line of commercial printers. In a grand act of millennial rebellion, he left the ink dynasty for enemy territory: digital marketing. After short stints in the worlds of music and PR, he finally found his home nestled into the process-driven magic of creative production. If you happen to spot a teenage mutt named Muddy prancing about the Denver office…Mike belongs to him. A self-declared nerd (New York State Science Olympiad champion for life), Rachel can and will school you in a game of “what bird is that.” And if avian trivia isn’t your thing, quiz her on her brewery geography: she’s only been to 90 of them. Her only known weakness is hot sauce. Meghan has been hooked on social since elementary school, when she created her very first AIM account. A few years later she was campaigning to get her friends and family on Facebook, and before long she’d completed her transformation into full-on social media magician. Her powers harnessed, she began conjuring up campaigns of her own, one of which even won a Cannes Titanium Lion. Whoa. Yes, Meghan has a twin. No, they are not identical. Being selected as the captain of her high school basketball team told Brigid one thing: her team leadership skills and generally positive attitude MUST be greater than her bench warming skills. A knack for meticulous to-do lists, tenacious bank account monitoring, and avoidance of her mother’s advice to go into Accounting led her to the wonderful world of Production and Account Management, which has proven to be the perfect fit. Baby Brigid spent the first year of her life in a body cast. From atop the sinking ship of his existentially confusing career in banking, Colin scanned the Great Sea of Employment for a champion. Just then, a friend shouted from a raft called Advertising. What luck—there were a few seats left! And people were drinking! With nothing but a copy of “Ogilvy on Advertising” in hand, he jumped in and started swimming. Colin is almost certainly going bald but can’t get anyone to believe him. Ana got into design the way we all do at age six: by drawing dalmatians. Practice makes professional, as they say, and today Ana can (and will, and does) draw anything she wants. Birds are her favorite, though: a serious bird nerd, she once kept three white doves as pets, and she still spends hours reading up on birds online. The rest of her energy goes toward good music and good food—proper fuel for any creative soul. Ana loves all things teensy. Special shoutout to tiny teacups and itsy-bitsy chairs. Michelle is an expert relationship builder and organizer of things—a true Virgo. She’s worked in community development, government, and on the other side of advertising, appearing in spots for Aussie brands you’ve never heard of. She fell in love with her future husband on a two-week holiday (that’s Australian for “vacation”) and moved here for good two months later. USA 1, AUS 0. In process there is peace. Jess’ vice isn’t coffee (ew) or chocolate (double ew): it’s jam-packing her time with ways to learn new things (like dumpling making) and ways to pass on what she knows (by TA’ing classes for up-and-coming UXers). She takes user needs advocacy dead seriously, so if you’re a user of anything, or have users using your thing, you’ll want Jess in your court. No, it isn’t short for Jessica. Ask again and just see what happens. Art or computers? Computers or art? Such were the questions tormenting Zach as he tried to map out life after college. Then he landed his first job at an ad agency and discovered he could do both. Huzzah! When he’s not pushing pixels, he’s probably playing board games or practicing parkour in hopes of becoming a real life ninja. He can standing broad jump over 7 feet on a good day. Likes: bonding over dislikes. Dislikes: Harry Potter anything, Buzzfeed anything, flash mob proposals, acapella, raw tomatoes, rainbow capitalism, doggo-speak, slow walkers on crowded sidewalks, and people who misuse the word “shade” (that’s 99% of you). If you hate any of the above, you and Tyler are probably already friends. At any given point in time he'd rather be half asleep on any beach. Sajjad is a lifelong taker-aparter of electronics and autopsy-er of their insides. As Madwell’s beloved surgeon of tech, he keeps our machines (and their humans) healthy and sane. Sajjad's long-game goals involve blending his great bedside manner and techxpertise—see what we did there—with his other, other loves: visual art and electronic music. Sajjad is a native New Yorker (is that really so unusual?). Chris was born and raised on the mean streets of Denver. Off duty, you can find him illustrating various food items, riding bicycles, creating 3D characters, and shredding in skate parks with his 30+ crew. He occasionally shows up to work with a homespun “mummy” wrap on his foot, a telltale sign that he “raged his brains out” just a bit too hard at the park the day before. He giggles. A lot. He blames it on nervousness and/or his love for all things in life. Experimental drama and brand strategy have more in common than you'd think. Both require a deep understanding of your audience, as well as obsessive research on a topic until you're an expert. And for her next trick, Madie will read your horoscope while playing lacrosse. Ask Madie about portage (after you google "portage"). After abandoning her childhood aspirations of rap and gymnastics stardom, Lauren decided writing was a suitable backup. Since then, the NYC native has penned things for some magazines you might've heard of and some brands that might be in your bathroom. She eagerly awaits Amanda Bynes' next project. Lauren will smoke you at Connect 4. This is not a test. You know that feeling you get when you become a designer just to work on the Harry Potter franchise, but then they wrap before you finish school? Or how it feels when you suddenly notice your phone isn’t in your pocket? Or when you can’t remember if you finished that cookie or just misplaced it? This concludes our tour of Paco’s psyche. Paco knows how to be awkwardly silent in 4 languages. Despite having never seen one in her whole life, Lynsey is terrified of leeches. Tori loves a good journey to a strange land. 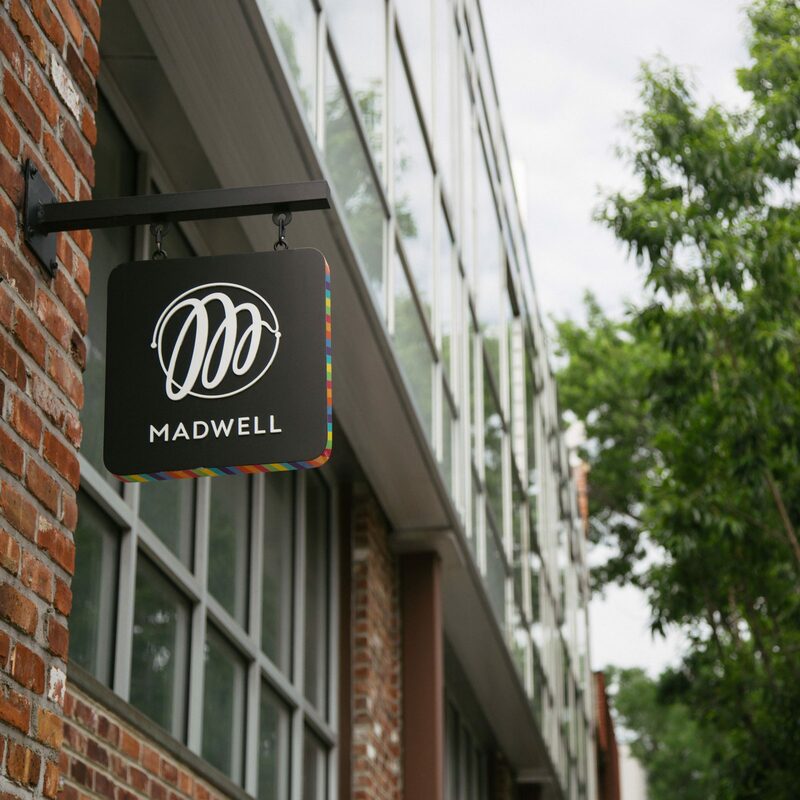 It’s a sense of adventure that landed her—among other places—right here, in the mystical world of Madwell media planning. Some observations from the road: humans are weird and fascinating, and her almost-famous turkey ricotta meatballs are up there as far as meatballs go. While Matt was always into drawing—in high school, he was an avid in-class doodler—he credits his father for turning him onto the Sunday comics. Matt counts Dr. Seuss and Doug Funnie among his influences, and in other news, he’d happily eat bagels with cream cheese and lox for every meal. If Matt had his way, “Return of the Mack” would play every time he entered a room. Ever heard of Liver Nifflies? Natalie couldn’t get enough of them until that day 17 years ago when she finally read the ingredients. A lover of the outdoors with “Rocky Mountain State” written all over her, when Natalie’s not hiking the hikes and camping the camps, you can catch her powwowing it out with her creatives. They keep her on her toes. Natalie once made the Denver Derby Dolls roller derby team. She never played...she just wanted to see if she could make the cut. Nicknames currently in circulation include Kalynnifer Lopez, Kalynnor Roosevelt, Don Kalyeone, Kaytor Tot, and Corn Nuts. Cecily was hanging out in the fashion industry, just minding her own business, when suddenly she fell through a trapdoor that led straight into advertising. Luckily she’s weirdly good at untying knots, which has come in handy. Plus there are Cheetos here (crunchy AND puffy). So far so good, people. Sydney didn’t need to visit the Empire State to know it was the place for her. She just packed her bags and boldly moved from Virginia, as you do. Her advice for all the other New York hopefuls out there: only fold your slice in the presence of real New Yorkers, winter is cold (like really cold), and another thing about that pizza: make sure to put hot sauce on it. Sydney is the proud dog-mom to one dachshund-corgi mix and the proud plant-mom to more plants than she prefers to count. At age 22, David “Steak” Salisbury (get it???) jetted off to Hong Kong to live the glamorous life of an underpaid junior copywriter. After getting his fill of being very, very far from home, he returned stateside for another dance with his beloved West Virginia (he’ll tell you all about it, trust us) before making the big move to the big city. David is a half-decent tennis player and half-decent saxophone player (just not at the same time). When Courtney was little, she “worked” with her architect dad by “borrowing” all his good supplies for her “creations.” Eventually (very eventually) she realized she liked graphic design more, and her dad’s supply stash was saved. You’ll know Courtney on sight by her Vantablack wardrobe and mega-seriously-for-real fear of clowns. Grey counts as a pastel. Master coder turned master planner, Sandy has been managing projects since before Williamsburg was cool (Remember Trash Bar? How about before Trash Bar was Trash Bar?) After a stint on the West coast—and an even briefer stint in the South—Sandy returned to her beloved Williamsburg, where she spends her days enjoying the neighborhood’s more “grown-up” perks. Sandy’s dream afternoon? Beach, booze, heavy metal. Completing creative marathons requires limber, buoyant legs and excessive stamina. At a solid 5 foot 7 inches tall Chris has the creative legs of a pigmy elephant combined with the speed of a full-sized adult cheetah (without the balance). Chris's design career began at the ripe old age of 5 when his mother provided him with a budget to decorate his bedroom to his liking. He has since maintained the philosophy that what he sees in his head he should attempt to manifest, no matter how hard, and always on a budget (for the most part). Feels that watching Nicolas Cage movies purifies the soul while connecting one's subconscious with the cultural zeitgeist. Especially Bangkok Dangerous. When you start out selling hearing aids over the phone (true story), you walk away with a loud voice and a pass to do literally anything else. Since that auspicious start, Jenita has worked in theatre, brand marketing, account management, and content production. Off the clock, she gets her kicks reading between the lines and making collages, which she completes to the halfway mark before abruptly stopping. At dive bars, Jenita typically orders tea. Right after graduating kindergarten, Allie set off on a straight-shot career path toward becoming a cat. She cut ties with that dream when she realized that cats can’t make color-coded spreadsheets, or buy themselves delicious New York pizza, or make a bomb marinara sauce every Sunday to soothe the pain of not even being Italian. Regarding Buffalo: no, there isn’t always six feet of snow; yes, the Bills lost again; and no, she doesn’t have the accent (anymore). Our mega-organized, type-A theatre buff got her start marketing “The Great White Way” before making her way off Broadway—way, way off Broadway—and onto Boerum Street. If she offers to make you a spreadsheet, define you a process, or serenade you a serenade, do the right thing and take her up on it. Alex once willingly paid for a full Olive Garden dinner despite being told they were out of the unlimited breadsticks. Success is about maintaining a strong set of personal values. Talamo values the power of things being organized all neat-like. He also values the power of extreme air conditioning, because the alternative is wearing shorts, and wearing shorts is a sure sign of moral weakness. NYC is full of world-class museums that Talamo visits once every never. Jason is a Texan who moved to NY because he heard about it in a rap song (really pretty much all rap songs not by Dre). His eyesight is on the Mr. Magoo level but his design third eye rivals the power of Cyclops (the optic blasts from the X-Man, not the Greek epic god-spawn). Branding and typography are his passions, as are bean & cheese tacos with bacon and guacamole. And bright colored shoes. In order to be employed at Madwell, Jason inadvertently spent a night in jail. Seriously, he was handcuffed on Madwell time. That's dedication. Contrary to urban legend, the infant Ben X. Trinh was not rocketed to Earth from a dying planet. (He was in fact born in Arkansas and raised in Memphis.) He's worn as many metaphorical hats as he owns pocket squares: illustrator, graphic designer, bartender, lead singer. You could say that this multitude of experience makes him ideally suited to Design Experiences, or something. Ben crafts a perfectly accurate margarita. When it comes to dollars and cents, Dan is our number one guy. Madwell’s financial spirit guide gets his kicks showing creative and finance how to collaborate in perfect harmony. When he’s not (gently!) crunching numbers, catch Dan pedaling a trusty two-wheeler around his great home state of New Jersey. He may have put his tuba practice on the back burner, but it was Dan’s low-brass training that inspired him to put his CPA skills to use in a creative industry. See that face? That's the face of the worst skier to ever grace the Rockies. While a student-citizen of the great state of Colorado, Emma had to be personally escorted down the mountain due to her dangerously low speed. On the upside, you’re also looking at a bonafide bagel expert (Brooklyn, baby) and a faithful member of the cult of snacktime. Emma has a debilitating fear of dead birds. Attention, Jackson: no gifts please. This Laura goes by many names (e.g., Jumpsuit) and wears many rings. She's sort of always been a writer, but it wasn't until she penned a short story about vampires and gave her English teacher nightmares that she considered pursuing it as a career. When she isn't staring into the void willing new thoughts to life, you can find her drinking whiskey at sundry dive bars and attending heavy metal concerts as well as non-thrash related musical happenings. Laura was born and raised in Louisiana (not New Orleans). She makes up for not having an accent by making really, really good gumbo. A proud grade school troublemaker, Cullen got his start with a not-so-well-received series of pen-on-desk doodles. While he’s since graduated from tormenting the Wood Acres Elementary custodial staff, he’s never stopped making and breaking. He’s also a fiercely passionate gamer, and by reading this you hereby agree to play him in a game of Catan. Cullen’s time living in Copenhagen made him a real hygge aficionado. Get comfy and give it a google. A many-hatted creative with an old soul, Courtney has done tours of duty everywhere from NYU Langone to CBS news in her capacity as a researcher, writer, analyst, and organizer of things. On a scale of way helpful to cool but less helpful are her photographic memory (legit, way helpful) and her chops as an actress and jazz singer (cool but slightly less helpful). "Old ideas and smugness drives no truck." Designer by day, rockstar by night— Monsha’s creative streak can be traced way back to her parents. Raised on Led Zeppelin and Deep Purple, Monsha was “forced” into service as the drummer of her family band, THE WONGS. When she’s not rocking out with her human family, you’ll find Monsha hanging out with her two particularly needy pups. Monsha’s hot take: “The Sims” should only be played on cheat mode. It all began in a one-room loft in Bushwick. While we’ve left the loft behind for a bigger spot up the block, we’re still in our native Bushwick—and now in Denver, too. Madwell is in a constant state of motion. 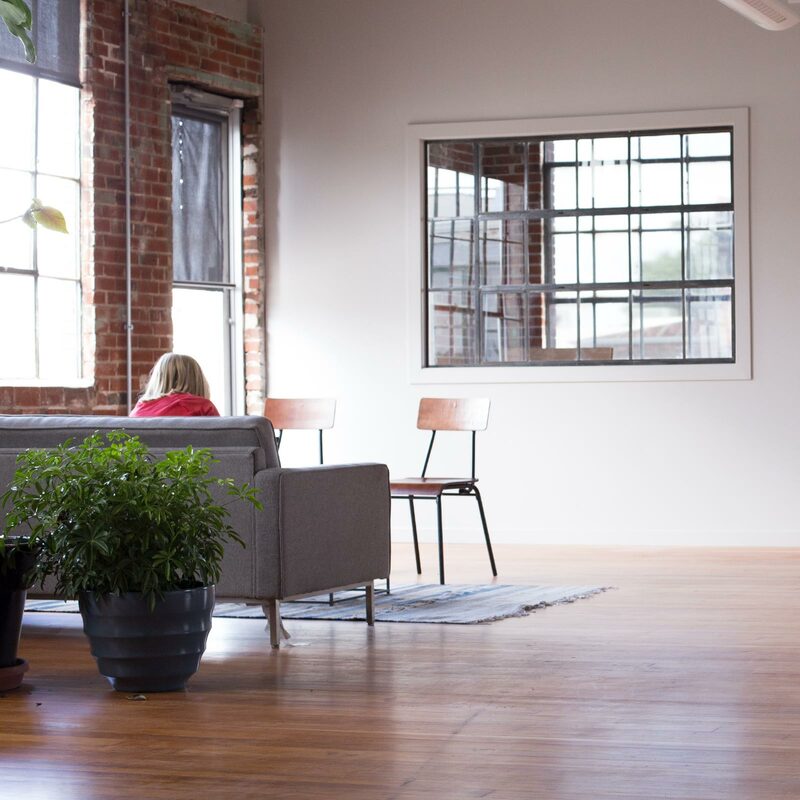 Our creative weather patterns change from one moment to the next, from room to room, from backyard to balcony, as we form, re-form, and re-re-form groups for work and play. While it’s gaining momentum as a beacon of Brooklyn cool, for us, Bushwick means business. 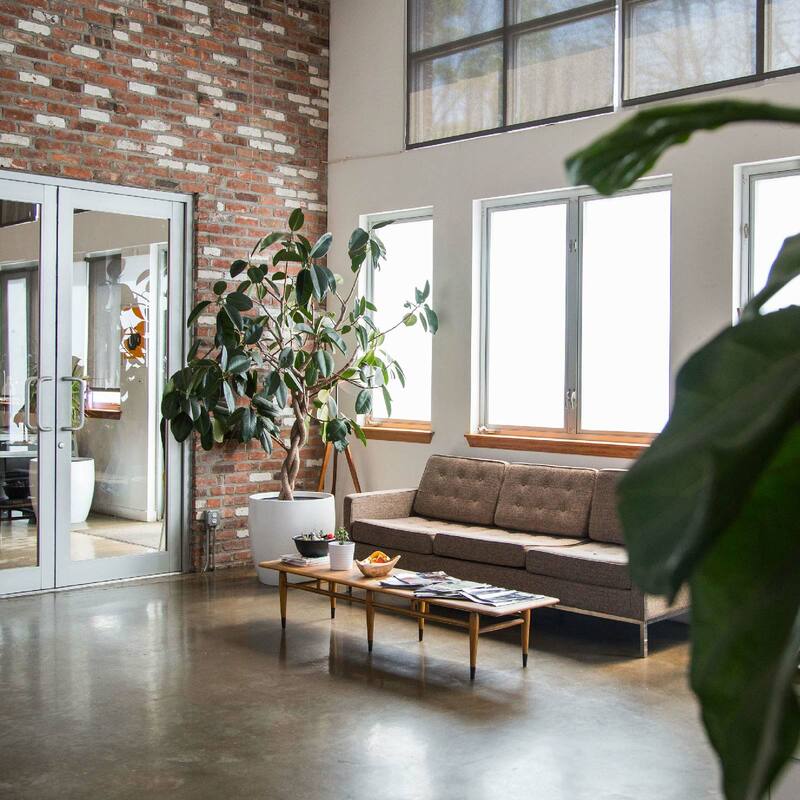 We’re situated along a stretch that’s equal parts residential and industrial, because that’s where the good ideas are. Our office itself is located right above Denver’s Central Market—specifically the bakery. Our mouths water all day long. 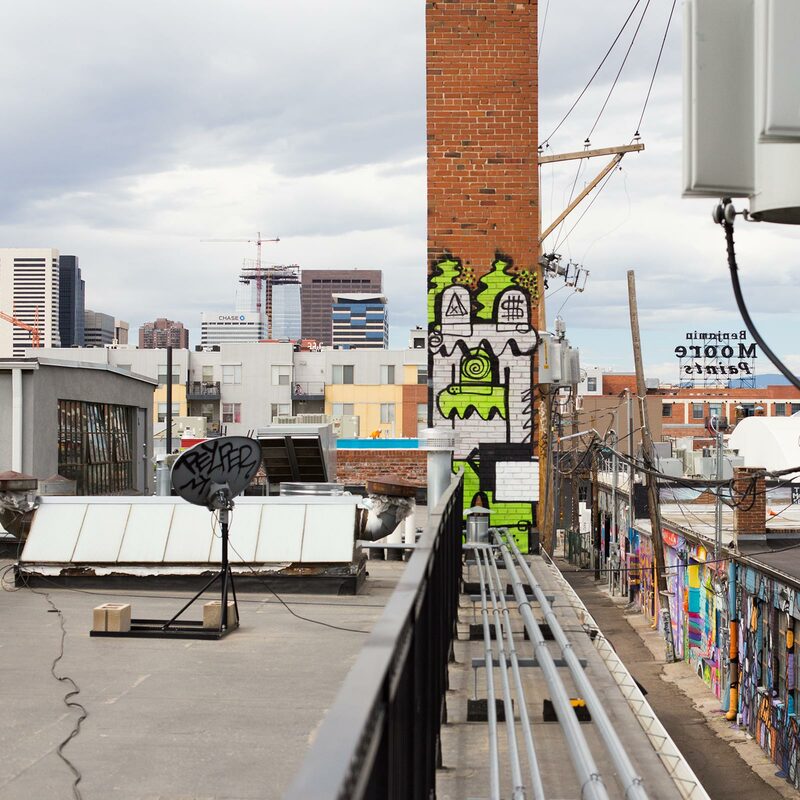 From craft brewers and distillers to artists and agencies, the RiNo district of Denver is a diverse creative hub. There’s inspiration to be found on every street corner. We’re always looking for the smart, purposeful, crazy people we need to help keep Planet Madwell spinning. Check out our open listings below to see who we’re hiring right now. Don’t see the position you have in mind? Need more information on the view from the Denver office or details about Brooklyn’s office cat? Sunderstorm (n): a thunderstorm with a side of sunshine.